A Star Wars Story was never going to be a super huge hit like The Force Awakens. Many, myself included, worried that a prequel about the backstory of the galaxy’s most famous smuggler was unnecessary at best. I even implored Disney, way back in 2016, to let the idea go. “Let this horrible, no good, very bad idea go and we’ll all forgive you,” I wrote. And I was wrong. More recently, I worried that Alden Ehrenreich simply couldn’t be Han Solo. How could audiences accept anyone other than Harrison Ford in that role? How could I? We went to Solo yesterday afternoon. I went in with my expectations fairly low. The trailers looked pretty good and director Ron Howard has a decent track record. He directed Willow, which is one of my very favorite movies of all time. Donald Glover looked like the perfect young Lando Calrissian. Still, this was a movie about young Han Solo and surely it would botch that one way or another. Surely I wouldn’t be able to get past the fact that Ehrenreich isn’t Ford. Surely we’d leave the theater mildly entertained and mildly disappointed. I couldn’t have been more wrong, though I suppose it never hurts to have your expectations low. 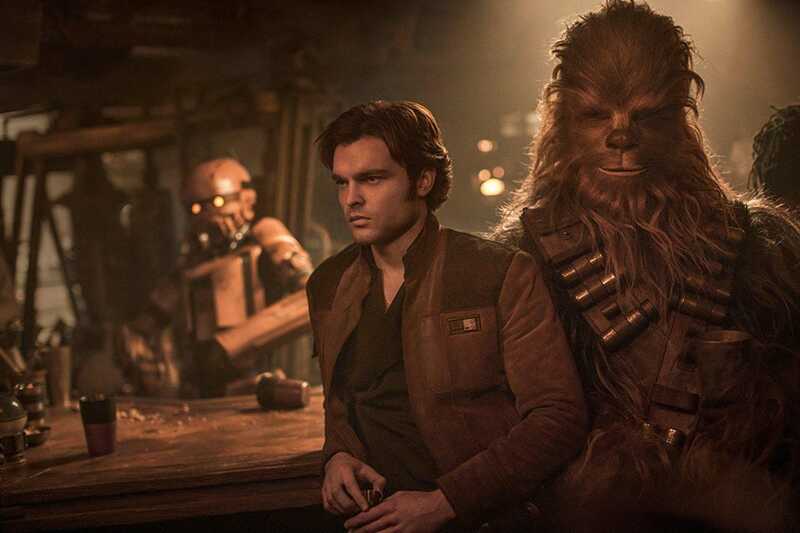 Solo, it turns out, is a fantastic new Star Wars movie. It also happens to be one that’s trendy to dislike. Right now the film is rocking a 71% ‘fresh’ rating on Rotten Tomatoes, but few critics—even those handing out a positive review—are enthusiastic about it. I’m not really sure why. The same critics who enjoyed the other recent Star Wars offerings, from The Force Awakens to Rogue One to The Last Jedi seem to hold their nose a little at Solo, damning with faint praise. It’s a good ‘popcorn’ flick seems to be the general consensus. It lacks gravitas, poetry, and stakes, but it’s fun and entertaining. Meanwhile, the harsher critics don’t mince words. “Whenever Star Wars tries to develop one of the franchise’s key characters, it whiffs. Solo is no exception, a disappointment on par with The Last Jediand the prequels,” writes Salon’s Matthew Rozsa. But placing either The Last Jedi or Solo in the same bracket as the prequels is absurd. Only someone who hasn’t watched the prequels in ages could say something so absurd. And while I do realize that The Last Jedi was controversial, I also believe that anyone who disliked that film for how it changed Star Wars so drastically will enjoy Solo for the same reasons. Solo is all about tapping into the Extended Universe. It’s pure, unfiltered Star Wars and it doesn’t try to add or change anything fundamental to the universe. It’s a smaller scale story about thieves and hustlers trying to make a living in a rough-and-tumble galaxy of powerful crime syndicates and a fascistic empire. Solo deserves to be a much bigger box office hit. I think it’s my second favorite of the new Star Wars films, right after The Force Awakens. I liked The Last Jedi. It was deeper and certainly more important than this film. But it’s also the one I’m least likely to watch over and over again. I guess time will tell. Rogue One was also good, but just like The Last Jedi, it planet-hopped much too quickly. 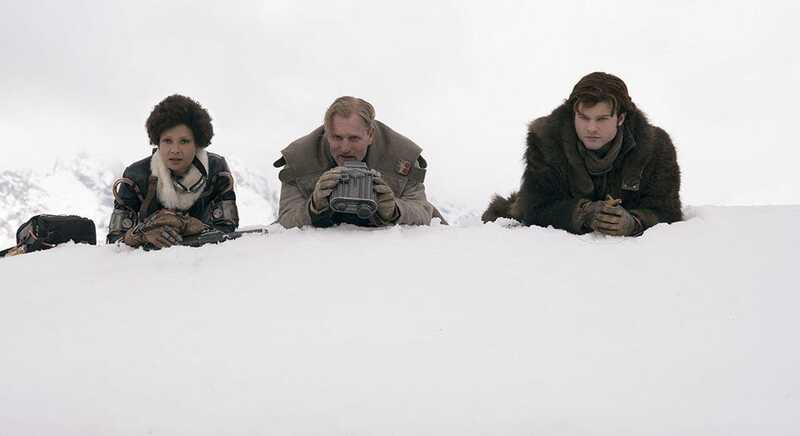 Solo actually gives us a little time to breathe and get to know each location. 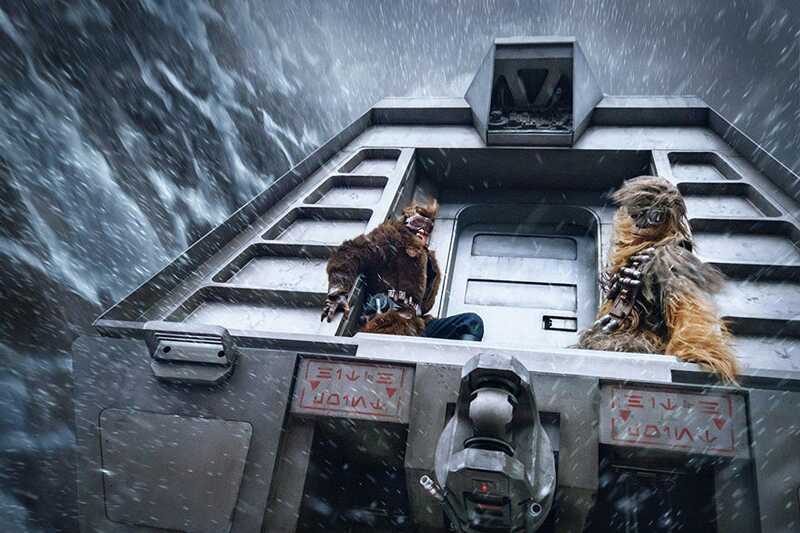 Like The Force Awakens, Solo is an adventure movie first and foremost. Unlike that film, all its heroes are a bit more grey and flawed, a bit harder to pin down—though Han Solo can’t help but let his inner hero shine, no matter how much he wants to pretend to be a rogue. He’s a romantic at heart. I liked all the characters. Tobias Beckett, played by Woody Harrelson, is the leader of a small band of thieves with dubious morals. 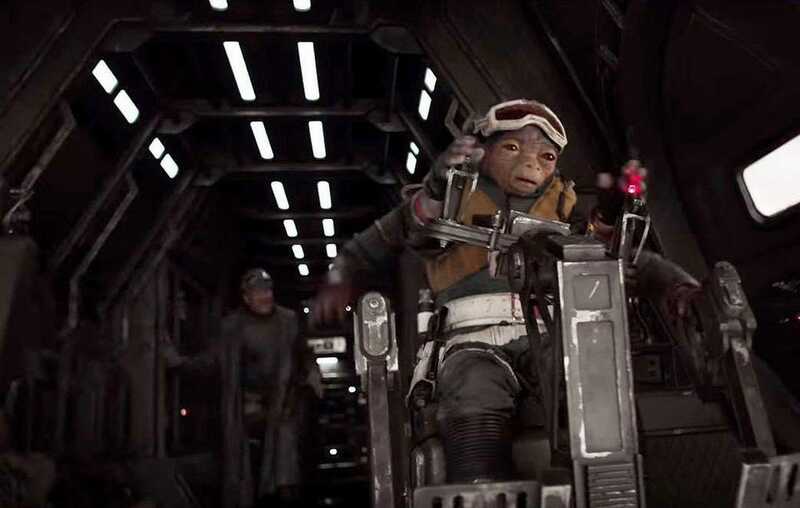 His crew consists of Val (Westworld’s Thandie Newton) and Rio (Jon Favreau) a four-armed alien pilot who is sure to be a fan favorite for years to come. Qi’ra has a checkered past. 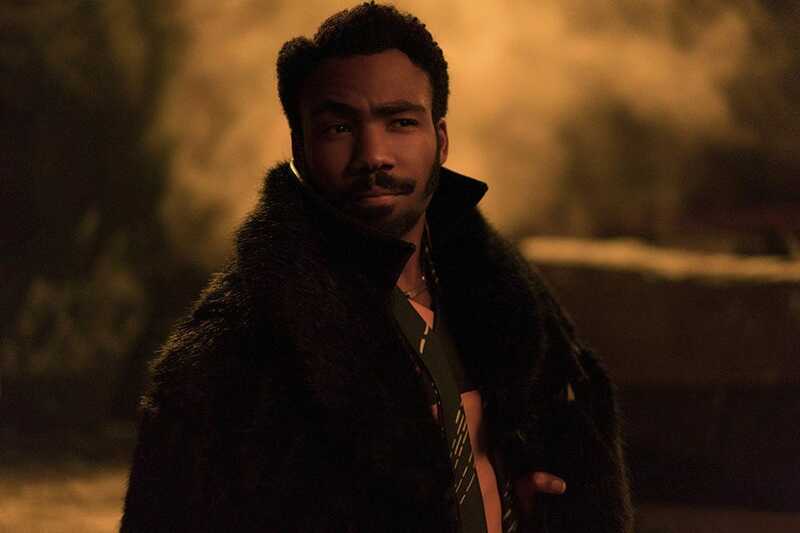 Donald Glover’s Lando Calrissian is another highlight of the film. 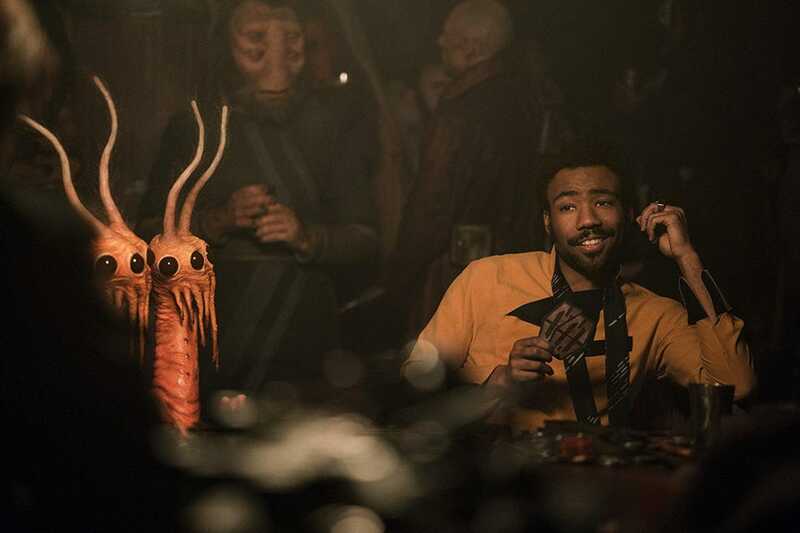 Glover is so perfect in the role it’s uncanny. We get to know a lot more about Lando in the movie, including his own rather flimsy relationship with morality. 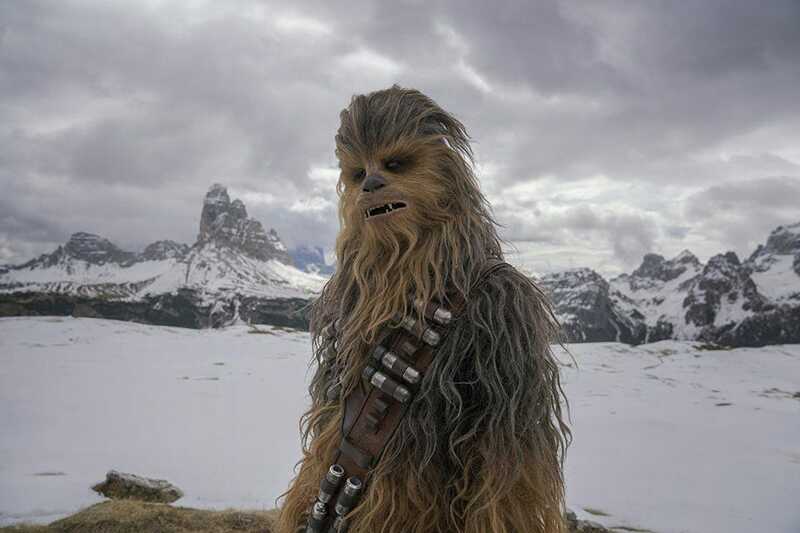 We get to know a lot more about Chewie, also, and the Wookies’ fate under imperial rule. Lando has a flimsy relationship with morality. 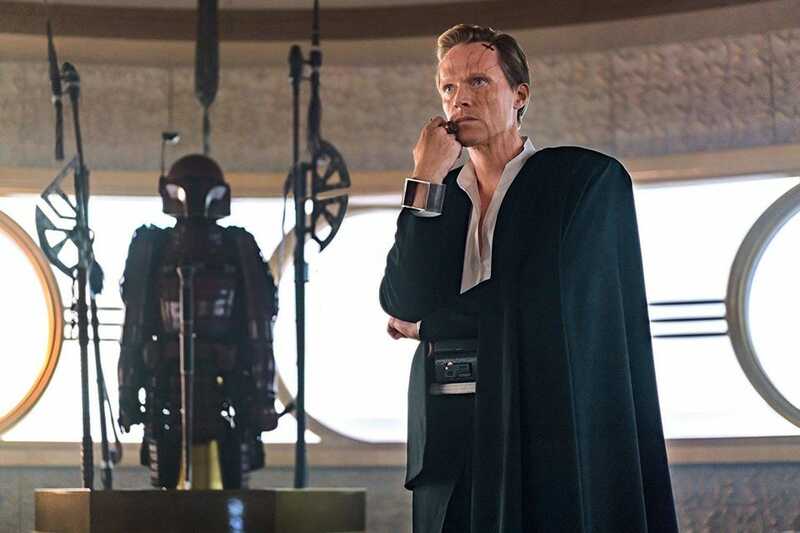 Lando’s sidekick in the film is the droid L3-37 (voiced by Phoebe Waller-Bridge.) L3 is the first droid in the Star Wars films with a real sense of her own plight. She’s obsessed with droid rights and angry over the way droids are treated like second-class citizens. It’s both hilarious and thought-provoking. While I won’t reveal exactly what happens with L3 in the film, I will link to this very interesting post about how L3 ties into the original trilogy. L3-37 thinks that droid lives matter. Bad guy Dryden Vos (Paul Bettany) the leader of the Crimson Dawn crime syndicate, is the perfect villain, though his real purpose in the film goes deeper than his villainy. 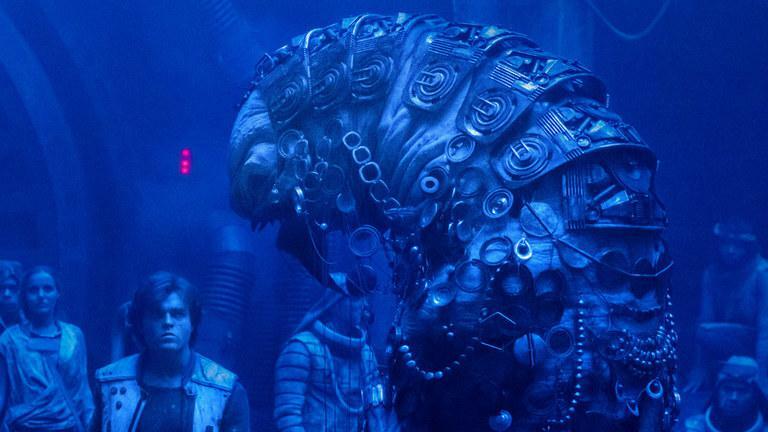 Meanwhile, crime boss Lady Proxima (Linda Hunt) is one of the coolest creatures I’ve seen in a Star Wars film. I just wish we’d gotten more of her character. I won’t spoil the story’s many twists and turns. Suffice to say, it’s a lot of fun and I can’t for the life of me fathom the complaints I’ve seen about it. It deserves to be making way more money at the box office. Audience scores are even more baffling this time around. Despite nabbing an ‘A-‘ Cinema Score, the movie is boasting a lousy 64% with Rotten Tomatoes audiences. That’s actually up from 55% when the film first launched. There’s a reason that score is so low (no pun intended): The denizens of the anti-Star Wars web purposefully review bombed it. Reading many of the audience reviews at launch and you’d notice that dozens complained about “SJWs” (social justice warriors) corrupting Star Wars. Many freely admitted to not having seen the film. In other words, these audience scores are worthless, corrupted by sad, angry man-babies who are upset that too many women and minorities are in Star Wars these days. These people should be ignored at all costs. They’ve become so obsessed with identity politics they can’t even enjoy a fun movie like Solo, which is about as apolitical as any Star Wars movie I’ve seen. They complain that SJWs are ruining movies with identity politics, bu then turn around and manufacture the exact same kind of outrage. It’s exhausting, self-defeating and childish. It’s one of the worst things the internet has produced and I’m sick and tired of it. Solo is not an ‘SJW’ movie. It’s a heist movie about aliens and intergalactic mafia. Grow up. In any case, do yourself a favor and don’t miss Solo on the big screen. I was an unbeliever. I was filled with doubt. I thought it was a stupid idea. Turns out, I was wrong. Solo is imaginative, surprising and incredibly true to the Star Wars universe. I can’t wait to go see it again.